For more information on the locations of these rivers, please refer to the Advanced Hydrologic Prediction Service on the Des Moines National Weather Service homepage. When submitting flood photos, please reference the location where the picture was taken, the time and date of the picture, and the specific river or creek name. The National Weather Service uses pictures for research, education, and to improve upon the quality of their river forecast products to better serve the public, other governmental agencies, and private companies. The National Weather Service will give credit to the photographer if your photo is used externally. 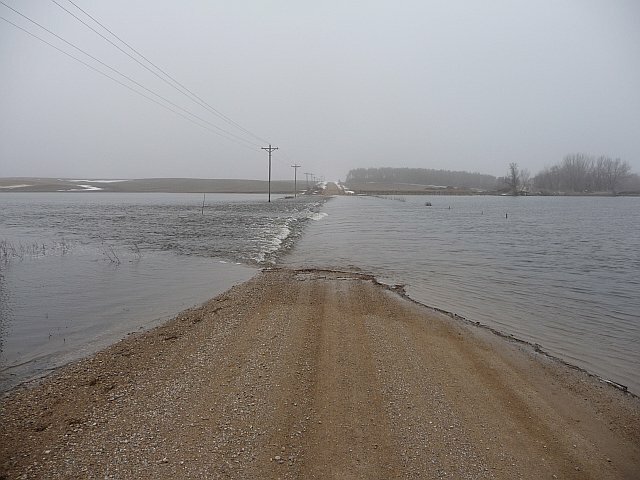 With the expected flooding across central Iowa, it would be a tremendous help to the National Weather Service with submitting photos of impacts from the river basins mentioned above or their respective smaller tributaries. Some examples of the type of pictures we are requesting are on the second page. We are looking for specific impacts due to river flooding. For instance, if the river covers a bridge or a road, floods a residential or commercial building(s), affects a significant amount of farmland, and any other impacts that you think would be pertinent. This would include flooding due to ice jams and snow melt. Iowa River at Rowan on March 16, 2010 along 200th street. Flood due to snow melt. Des Moines Weather Forecast Office Hydrologic Service Area. If you have any photos near any of these Forecast or Data Points, please submit them to DMX.spotterreport@noaa.gov or send them via Twitter or Facebook. 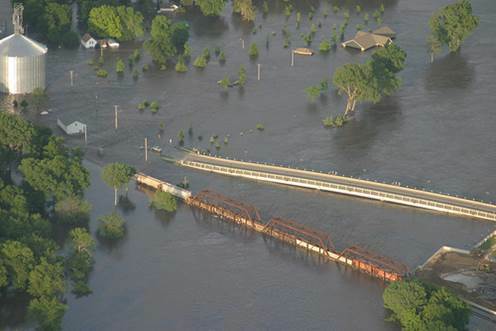 This is the Union Pacific Bridge over the Cedar River in Waterloo. The bridge was partially damaged by the record flooding back in June of 2008. 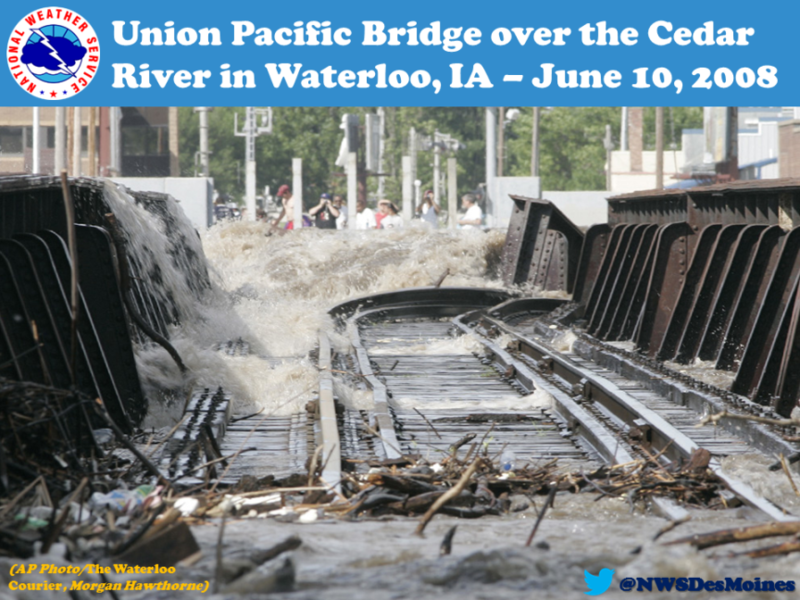 The crest at Waterloo was 27.01 feet on June 11, 2008. Previous record was 21.86 feet on March 29, 1961. Image courtesy of Morgan Hawthorne – Waterloo Courier. Des Moines River at 2nd Avenue looking downstream. Photo taken by Ken Podrazik/Karl Jungbluth on June 12, 2008. The crest at this location was 31.57 feet and occurred on Friday June 13, 2008. The record crest was 31.71 feet on July 11, 1993. The blue circle on the Google map above is location of this picture directly below it. This was taken along the Des Moines River on the corner of 2nd Avenue and Hickman Road in downtown Des Moines which is the location of the USGS river gauge and river forecast point DMOI4. The picture was taken on June 12, 2008, around 1530 UTC (10:30 a.m. CDT). The stage at 1100 UTC (6 a.m. CDT) that morning was 28.89 feet, while the stage the following morning on the 13th was 31.17 feet at 1100 UTC (6 a.m. CDT). The flow was 48,100 CFS on the morning of the 12th, and increased to 51,300 CFS by the morning of the 13th. Another way to see CFS is to relate cubic feet to a basketball. So, imagine a wall of 51,300 basketballs (1 basketball = 1 cubic foot) flowing past the rocking chair every second. The distance from the bank of the river to the blue circle is nearly the length of a football field. 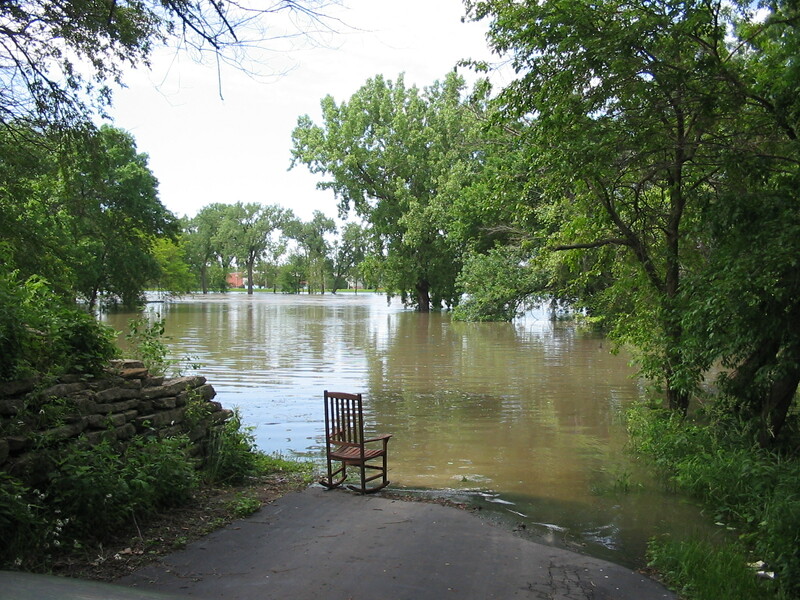 The Des Moines River crested at 31.57 feet on the 13th at around 1800 UTC (1 p.m. CDT), which eventually rose further up the driveway engulfing the location of the rocking chair. 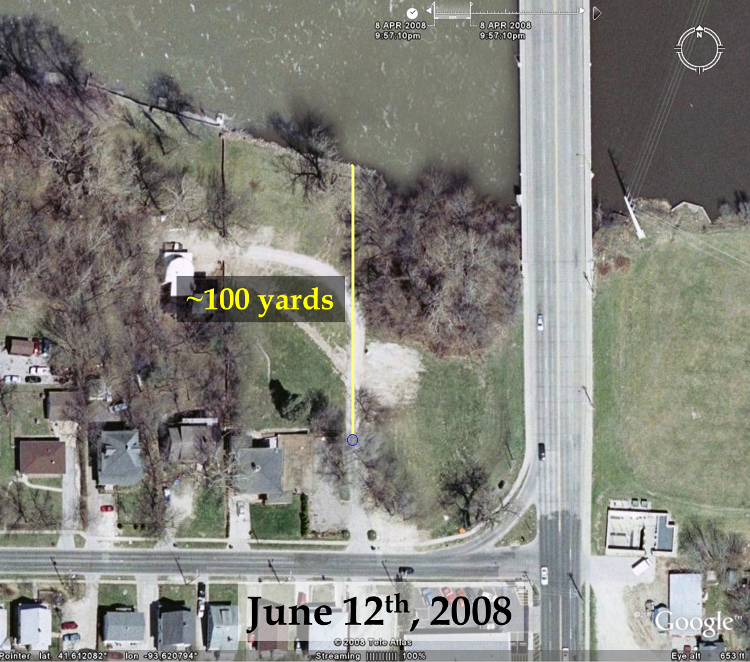 Video of the Des Moines River on June 19, 2008 at the USGS river gauge in Tracy, Iowa (TRCI4). The flow, measured in cubic feet per second (CFS), was 85,600 and the height of the river was 22.4 feet. The crest of 23.70 feet occurred on June 14, 2008, but this was a great example of what 85,000 CFS looked like up close. The video was taken on an old railroad bridge right by the wire weight, which is seen at the beginning and end of the video. At this site, the USACE estimated that the crest would have been 3 to 4 feet higher if there was no Red Rock Reservoir. 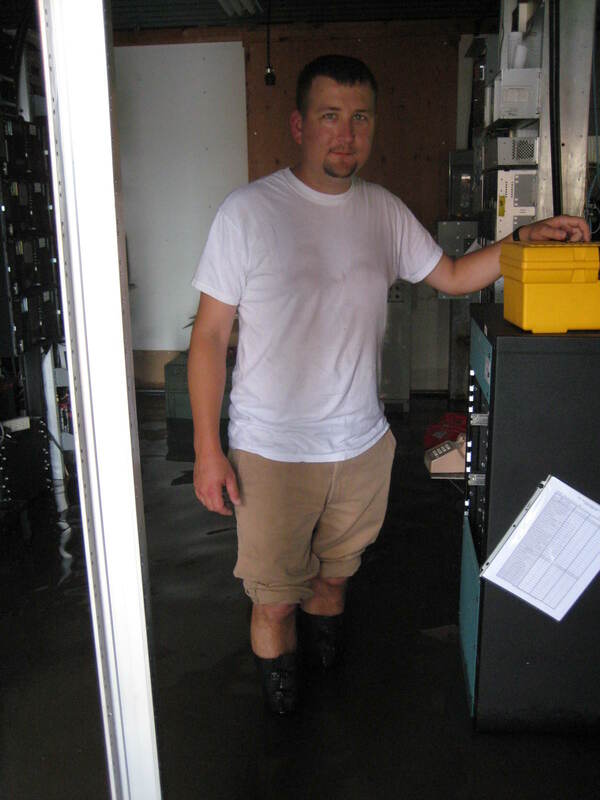 Dave Reese – NWS Des Moines Electronics Systems Analysts treads flooded water from the Iowa River at Marshalltown. The small building at the right is where the Marshalltown NOAA Weather Radio Transmitter is located. There was already about a foot of flood water into the building. Photo taken June 9, 2008 by Ken Podrazik. 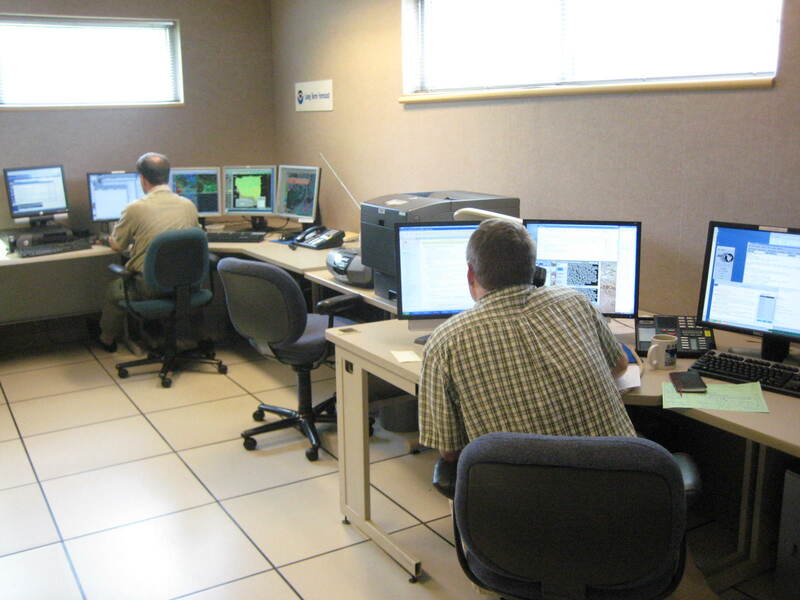 The NWS Des Moines Office on June 9, 2008. Roger Vachalek on the left and Rich Kinney (now at NWS Quad Cities) on the right. 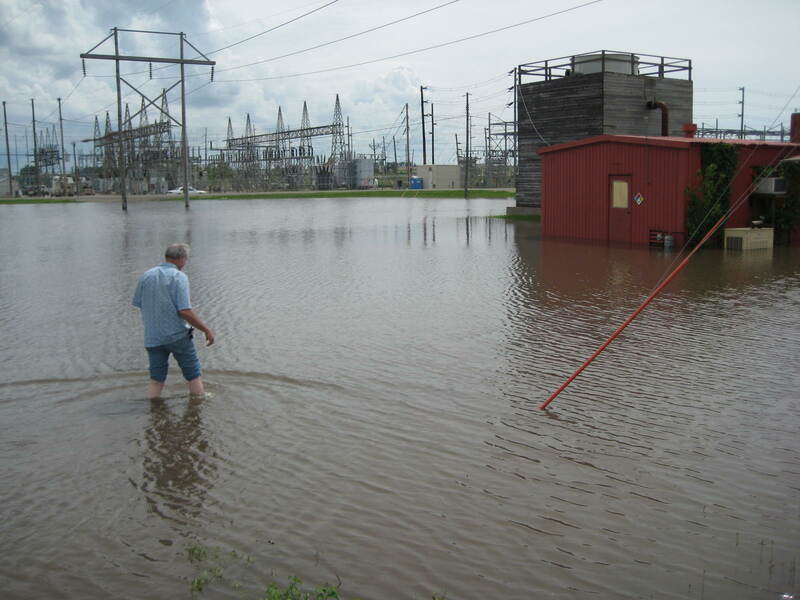 The NWS Des Moines meteorologists put multiple long days during the month of June 2008 including staffing the State Emergency Operations Center 24-hours a day for a 10 day period during the height of the flood. 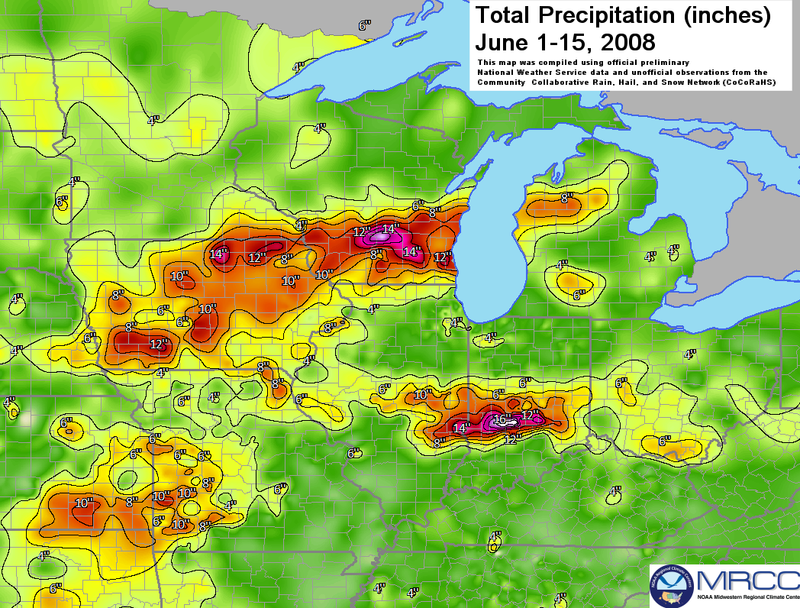 The Cedar River Basin was hit the hardest with several record crests that occurred in mid-June of 2008. The Des Moines and Iowa River Basin received moderate to major flooding, but few records were set in 2008. 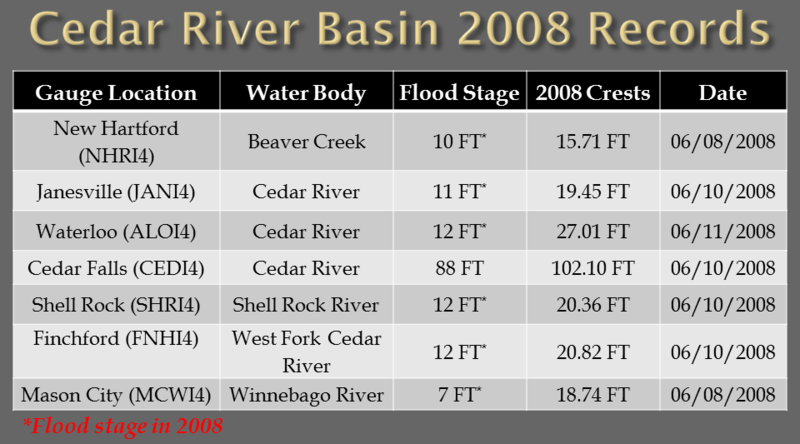 Cedar River Basin crest records set in 2008. 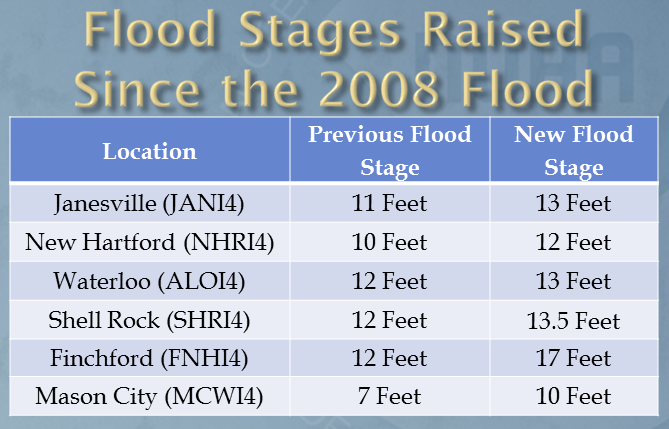 Flood stages raised since 2008. Waverly, Iowa in mid-June 2008. Photo courtesy Reynolds Cramer. A few other locations, other than in the Cedar Basin, set new crest records. However, two of these set new records in 2010. 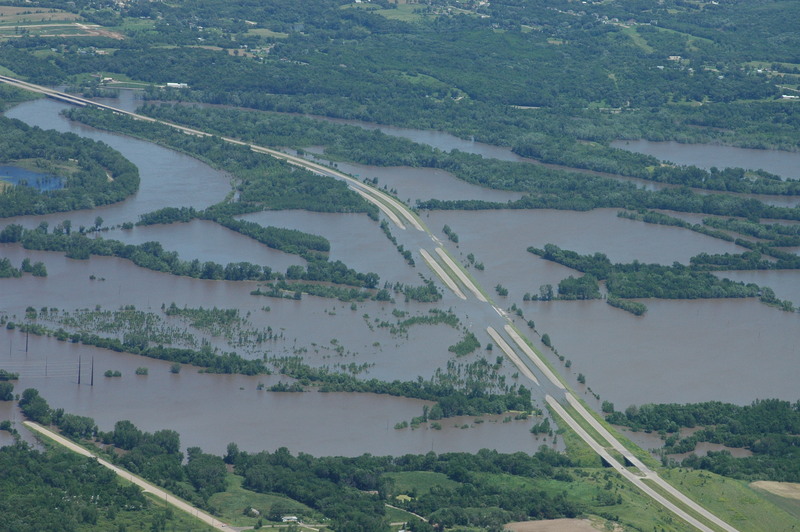 The Des Moines River over Highway 65 southeast of Des Moines on June 14, 2008. Photo courtesy of the Civil Air Patrol. 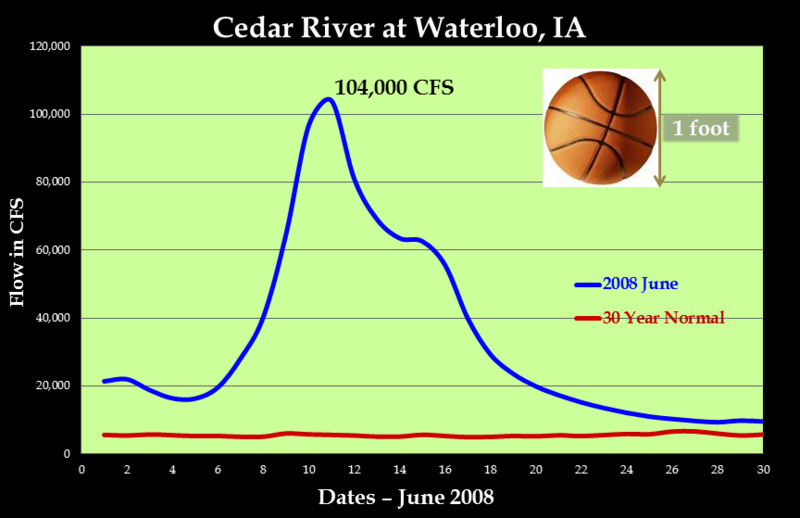 Hydrograph (in cubic feet per second-CFS) of the Cedar River at Waterloo during the month of June 2008. The crest was roughly 104,000 CFS or cubic feet per second on June 11, 2008. To visualize what CFS, a cubic foot is roughly the size of a basketball or a gallon jug of milk. Imagine a wall of 104,000 basketballs/milk jubs each second flowing past a certain point on the river. Pretty impressive. 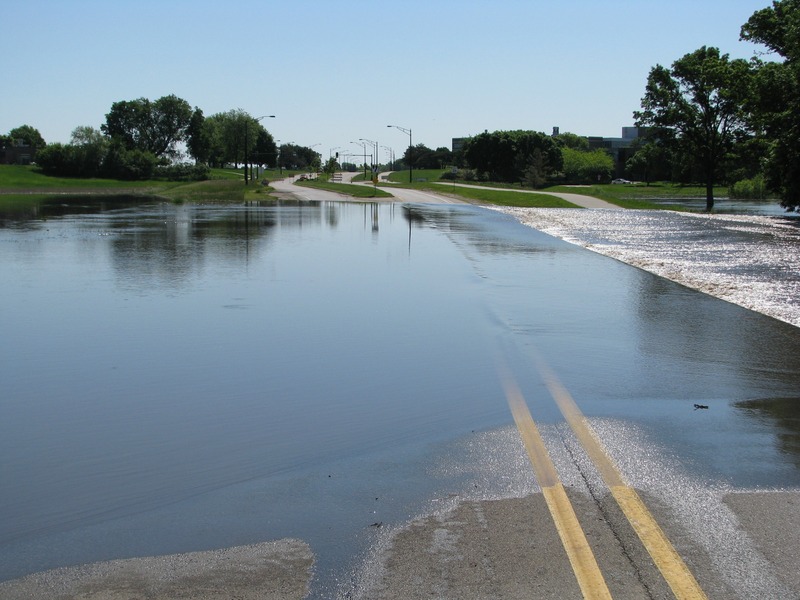 A dynamic, new online flood preparedness tool which will help emergency managers improve flood warnings and response has been developed for the Cedar River at Waterloo, Iowa. The National Weather Service collaborated with the Iowa Flood Center to develop a library of flood inundation maps. 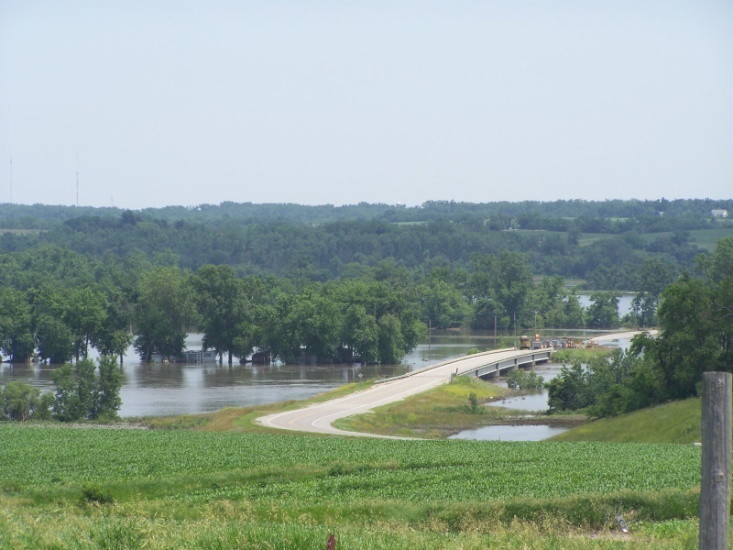 The final version of these flood inundation maps are the culmination of a partnership between the Iowa Flood Center (IFC), the City of Waterloo, the NOAA Central Region – Regional Collaboration Team and the National Weather Service (NWS). This capability will help communicate the residual flood risks for areas behind the city’s levee and the additional flooding from Black Hawk Creek, a tributary to the Cedar. Because this new tool is so critical during floods, it is available from two sources. The first source is the NWS Advanced Hydrologic Prediction Service (AHPS) Web site. On the AHPS page for the Cedar River at Waterloo, click on the tab near the top of the page named “Inundation Mapping.” The direct link is http://water.weather.gov/ahps2/inundation/inundation_google.php?gage=aloi4 . 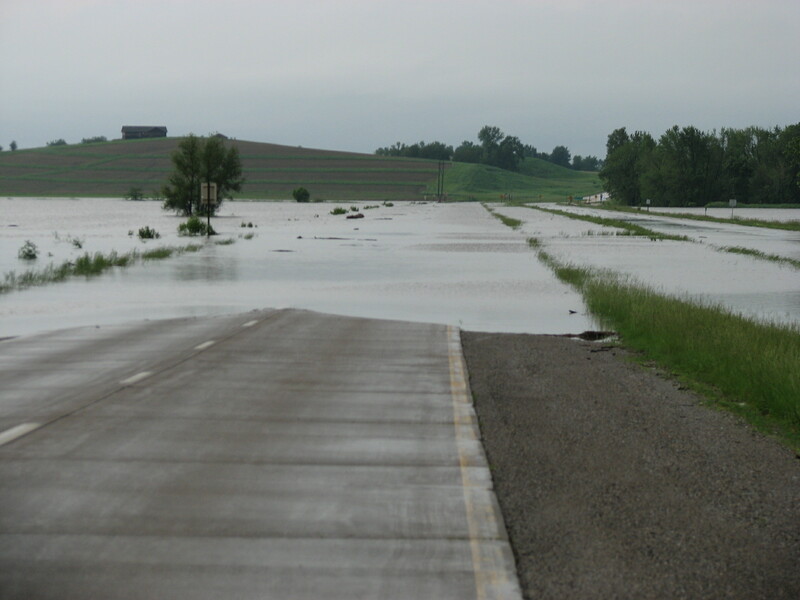 The second source is the Iowa Flood Center’s Iowa Flood Information System (IFIS). The direct link is http://ifis.iowafloodcenter.org/ifis/en/ . Go to the Flood Maps section on the right hand side of the page and select Waterloo. 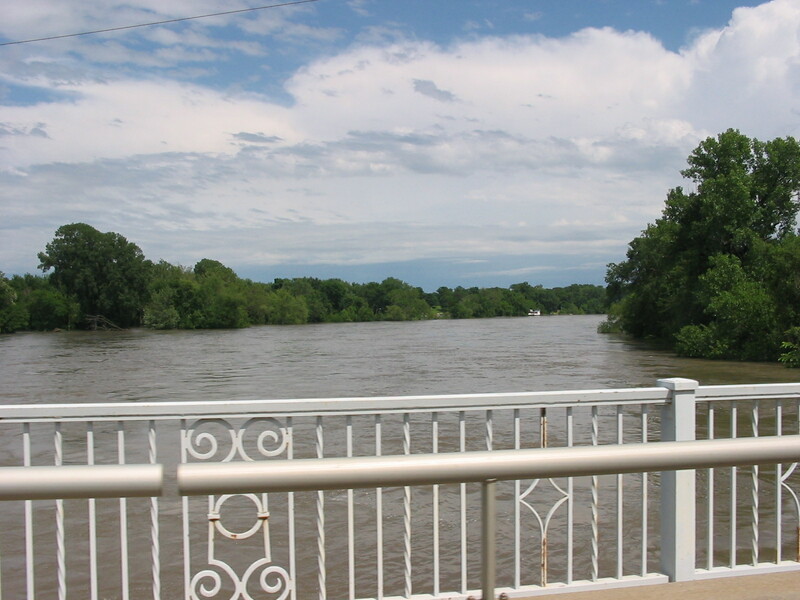 The Waterloo flood inundation maps are based on observations and forecasts involving readings from the U.S. Geological Survey (USGS) stream gage along the Cedar River at Waterloo. More information about USGS streamgaging in Iowa is available on the USGS Iowa Water Science Center Web site. The National Weather Service is working with its partners to build a Weather-Ready Nation to support community resilience in the face of increasing vulnerability to extreme weather. Visit http://www.weather.gov/desmoines, and follow us on Twitter @NWSDesMoines and on Facebook. 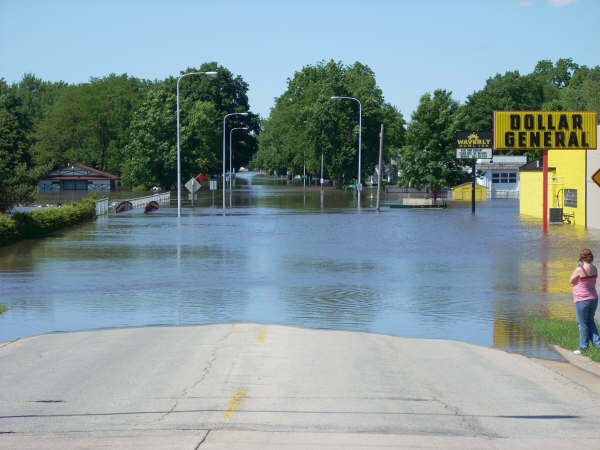 A dynamic, new online flood preparedness tool which will help emergency managers improve flood warnings and response has been developed for the Cedar River at Cedar Falls, Iowa. The National Weather Service collaborated with the Iowa Flood Center to develop a library of flood inundation maps for the Cedar River. The final version of these flood inundation maps are the culmination of a partnership between the Iowa Flood Center (IFC), the City of Cedar Falls, the NOAA Central Region – Regional Collaboration Team and the National Weather Service (NWS). This capability will help communicate the flood risks for areas along the Cedar River. Because this new tool is so critical during floods, it is available from two sources. The first source is the NWS Advanced Hydrologic Prediction Service (AHPS) Web site. On the AHPS page for the Cedar River at Cedar Falls, click on the tab near the top of the page named “Inundation Mapping.” The direct link is http://water.weather.gov/ahps2/inundation/inundation_google.php?gage=cedi4 . The second source is the Iowa Flood Center’s Iowa Flood Information System (IFIS). The direct link is http://ifis.iowafloodcenter.org/ifis/en/ . 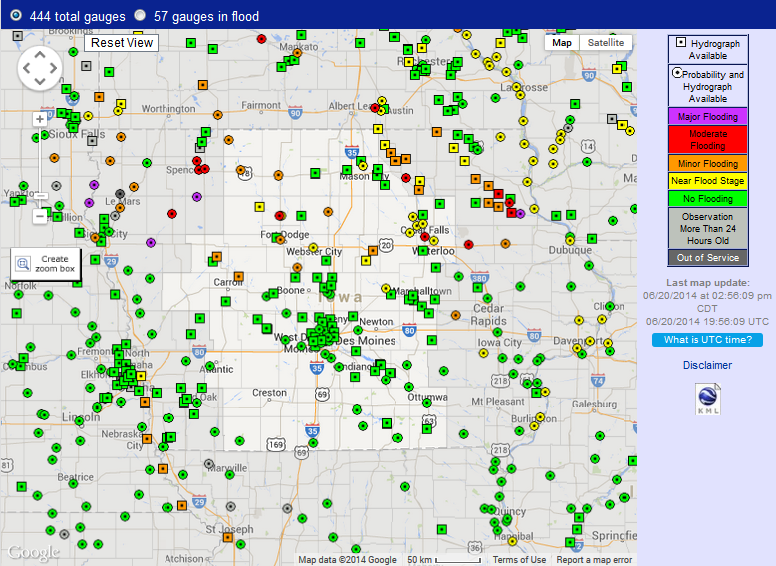 Go to the Flood Maps section on the right hand side of the page and select Cedar Falls. A new software upgrade has been installed at the Des Moines WSR-88D radar that will enable the radar to obtain low level scans more frequently in severe weather events. Previously, the WSR-88D scanned the atmosphere at progressively higher angles to create a 3D profile of a storm. These scans would begin at 0.5 degrees above the horizon (the lowest angle possible) and end at a maximum angle of 19.5 degrees. These scans form what is known as a Volume Coverage Pattern, or VCP. This maximum angle can vary depending on the distance the storms are from the radar. Last year, a feature called AVSET (Automatic Volume Scan Elevation Termination) was installed that allows the radar to automatically restart a VCP if the radar beam travels above the storms. With this latest upgrade, a new feature called SAILS (Supplemental Adaptive Intra-Volume Low‐Level Scan) will enable the radar to insert an additional 0.5 degree scan in the middle of a VCP. See the illustrations below for more details. A “sun spike” removed from the Minneapolis radar while radars to the north and south (which had not been upgraded yet) still contain these spikes. The Iowa Homeland Security and Emergency Management Division, and the National Weather Service have declared June 5, 2014 as Heat Awareness Day in Iowa. Extreme heat is a seasonal hazard in Iowa which is often underestimated. Did you know that heat is the number one weather-related killer? Understanding heat safety is important and can save lives. Summertime in Iowa means two things: heat and humidity. These two weather parameters combine to create the Heat Index (Apparent Temperature), which is an accurate measure of how hot it really feels when relative humidity is combine with the actual air temperature. The combination of extreme heat and humidity conspire to tax the human body beyond its natural cooling abilities. Heat related deaths account for many deaths and injuries each year. Just how hot can the interior of a car become? 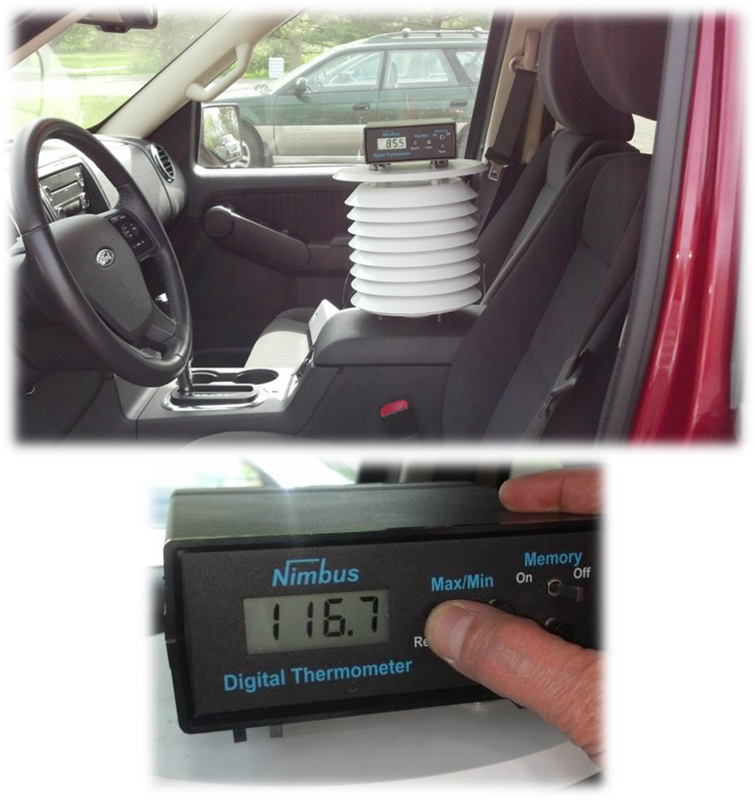 To find out, last year we placed a thermometer inside a car parked outside in the sun during a full work day. The high temperatures on the day we conducted our experiment only reached 80°F. However! The interior temperature in the car reach 117°F! A car with the windows cracked showed a similar temperature rise. Even on a relatively mild day, the interior of a car can become dangerously hot for children or pets left unattended. Never leave children or pets unattended in a car, even for short periods of time. 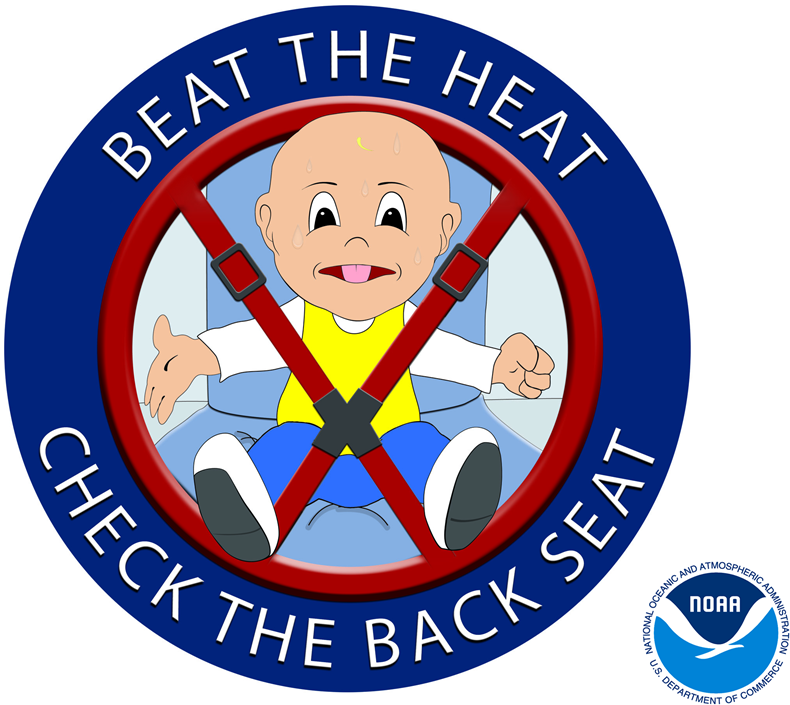 Remember: Beat the Heat, Check the Back Seat! The Heat Index (HI) is sometimes referred to as the “apparent temperature” and is a measure of how hot it feels outside to the human body. The HI includes the influence of both the actual air temperature and relative humidity. The body dissipates almost 90% of its heat through sweat but sweating by itself does nothing to cool the body unless the water is removed by evaporation, and high relative humidity hinders evaporation. To figure out the HI, reference the Heat Index Chart and find the intersection of the air temperature and relative humidity. The shaded zones on the chart correspond to the probabilities of developing heat-related disorders. Heat disorders are generally a result of the body’s inability to shed excess heat by sweating or a chemical (salt) imbalance caused by too much sweating. When heat gain exceeds the level the body can remove, or when the body cannot compensate for fluids and salt lost through perspiration, the temperature of the body’s inner core begins to rise and heat-related illness may develop. 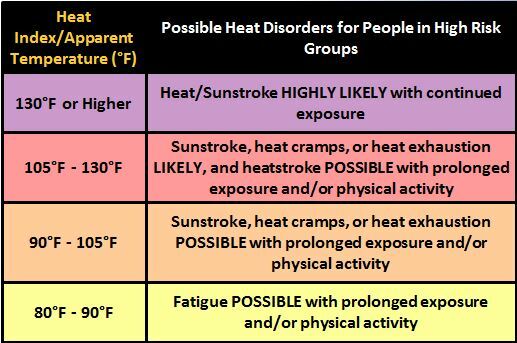 The table explains the risk to the body from continued exposure to excessive heat and is color coded to match the HI chart shown.